I do this rarely, but I'm going to turn it over to another blog today. A blogging pal of mine, Stephen Pentz, keeps a wonderful poetry blog called First Known When Lost. He posts poetry and some of his own commentary introduces the conceptually connected poems of the day (commentary that he tends to downplay in its importance, but that I always find insightful and thought-provoking). Yesterday, he posted a passage from Wittgenstein, who is often nebulous, but who, in this case, at least in my opinion, gets it perfectly, in terms of the relationship of science to the world. As Stephen puts it, "science only provides descriptions of the World. It has nothing to do with intimation." Indeed. 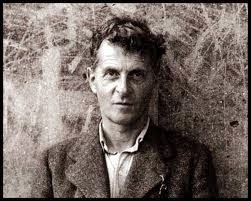 Read the short passage by Wittgenstein HERE, along with Stephen's full commentary and the poems he selected, related to the subject. I can't say whether I agree or disagree until I know what you think the writer means by "science has nothing to do with intimation" and what Wittgenstein means by "people stop short at natural laws as at something unassailable." Both of these statements could either display a great misunderstanding of science or a great level of abstract thought unconcerned with the empirical, where the latter is fine because it is context specific. Could you clarify? Hello -- and thanks for commenting. For me, intimation is a revealing of truth in an indirect and (often) poetic way -- a way in which only poetry or other art forms can reveal truth. Science might tell us that the red glow of a sunset sky is the result of light filtering through vapor but poetry tells us that this light is a manifestation of the profound and complex patterns of nature. Certainly, science is right -- and it sort of says the same thing in terms or revealing the truth of the head, but poetry reveals the truth of the --what? -- heart? -- spirit? -- soul? It says things without saying them literally. We get, sometimes, an inexplicable sense of this-it-itness from poetry that we know is deep truth that will never be able to be put into prosaic terms. Science just shows us the nuts and bolts, as it were. Poetry gives us a sense of the whole machine. I think that what Wittgenstein means manifests itself in some current findings in science, especially in areas like quantum physics. Wittgenstein is saying that where we once refused to question the absolute (and possibly fundamentalistic) veracity of religion -- or dogma, if you will -- we now do the same with science. But quantum physics shows us that science is not absolute. Sometimes scientists find themselves scratching their heads: "Light is simply not supposed to do that..." -- or things of that nature. Thanks again, anonymous, for such a thought-provoking question. In that case, of course science is not absolute, but enough people find poetry in science for it to be considered much more than just nuts and bolts, as you put it. I hear a lot of quantum woo day-to-day (I work in telecommunications) but that's the wonderful thing about science. It's malleable, and it never claims to have all of the answers. So I guess I understand what you're saying but I also believe science can, in fact, be intimate. Thank you for your honest response, but I always try to be careful in these situations. I love poetry, and I love the abstract, but when the abstract tries to make claims about the concrete (which can be abstract), it starts to induce wars. That said, I think the problem is not in the two areas (science and poetry) but in our individual concepts of them. There are those who do see science as absolute and as the source of all answers and there are those who see poetry as a waste of time... There will, indeed, be wars between these folks. It is true that there is poetry in science and it is also true that this intrinsic poetic profundity can only be expressed BY poetry. Now that I read your response, I realize the phrase "nuts and bolts" is an unfair way to define science. Science is not "nuts and bolts" but it expresses itself in a "nuts and bolts" manner; poetry points out that science is more than that. The two should be seen, after all, as symbiotic... Then, no wars! Thanks again for commenting. You just can't go wrong checking in every day with Stephen at First Known When Lost. His blog is such a nice little e-sanctuary from all the usual online noise. Completely true, Jeff. Steve is a gem among bloggers.